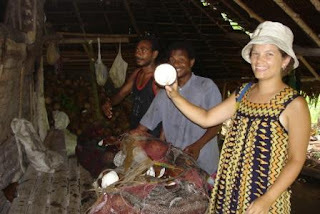 Our village, Banana Bush, is located on plantation that grows coconut and cacao (other wise known as cocoa). Part of the stipulation allowing them to live here, was that they would work on the plantation. 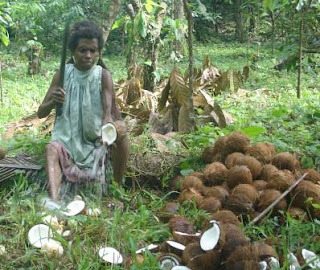 There were different kinds of work, but one that was a project of the whole family was working “copra”. It is quite a process. 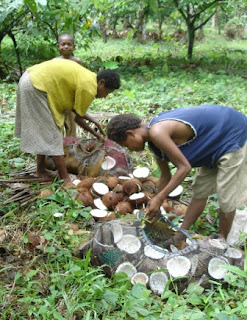 They collect the mature coconuts, husk them, and cut them in half, as mama is doing using a bushknife. 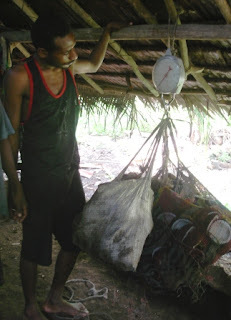 Then they are loaded into large bilums and carried to a “haus coppra” for weighing and drying. 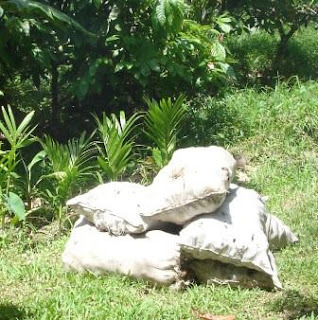 When they are dry, then they are “shelled” and the dry insides are loaded into sacks and sold to the plantation. 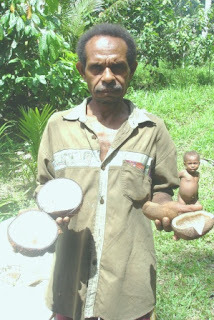 In this last picture, Papa is holding a split coconut on the left, and dried “copra” on the right.